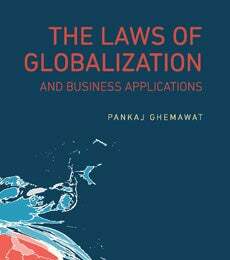 The Laws of Globalization and Business Applications, by Professor Pankaj Ghemawat, provides a data-driven discussion of globalization at the world, country, industry and firm levels. It is aimed at academics, students and practitioners in business and public policy. The Laws of Globalization employs a variety of methodologies to establish two broad regularities that apply to international activity at the firm, industry and country levels -- the law of semiglobalization and the law of distance -- and explores some of their implications for business. Part I of the book presents evidence in support of the law of semiglobalization at the country and the business levels, both historically and up to the present. Part II reinforces the second law of globalization, showing that the gravity models that international economists have used to analyze merchandise trade between countries also apply to other types of international interactions -- and at the industry and firm levels as well. Part III applies these laws to various challenges and opportunities that distance presents to multinational firms. A free online appendix provides additional data, analysis and documentation to support research applications. Professor Pankaj Ghemawat is a Global Professor of Management and Strategy and the Director of the Center for the Globalization of Education and Management.